Isn’t that better? Hopefully it will be just as easy for you to part with any lukewarm thoughts you’ve ever had about Brussels Sprouts. Because once you’ve roasted them, you’ll never want them any other way. (Well, except maybe raw in this awesome salad.) 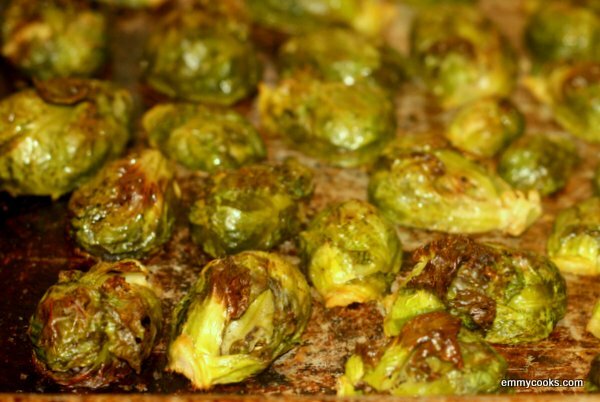 Roasting does this special thing to Brussels sprouts where the outer leaves get crisp and salty and the inside becomes sweet and nutty, and all it takes to reach Brussels sprout perfection is is one simple secret…. Salt. Salt the sprouts generously on the way into the oven, and salt them again after roasting if they’re not as salty as good french fries. And, ok, one more secret: make twice as many as you think you’ll need, since these mysteriously start disappearing from the baking sheet as soon as they leave the oven. Roasted Brussels Sprouts: Trim any yellowed leaves or woody stem ends from a big pile of Brussels sprouts, cutting them in half only if they’re very large. (If you can get them by the branch at your farmers market, that’s a treat.) Toss with olive oil and a generous amount of salt. Bake at 400, turning occasionally, until the sprouts are crisp and golden all over. Remove from oven and sprinkle with additional salt to taste. This entry was posted in Easily Multiplies to Feed a Crowd, Food, Recipes, Vegan or Would-Be-Just-As-Good-Vegan, Vegetables By Themselves and tagged brussels sprouts, CSA recipes on November 9, 2012 by emmycooks. I did this last week and they were great. I’ll definitely have to try this. I love Brussels sprouts as they are, but these look and sound even better! I understand the Brussels sprouts haters about as much as I understand the haters in a certain U.S. political party! My brother and I used to fight over them—and that was in the dark ages of frozen only sprouts. This is one of my favorite ways to prepare them. I can eat Brussels sprouts now (unlike when I was a kid, when I couldn’t hold them down but that may have been due to overcooking them) but still don’t care for them. That’s the reason why I haven’t tried them roasted yet, even though I know that works marvels for most veg. I like the idea to salt them heavily. There is a special dynamic between bitter and salt that I don’t fully comprehend (yet). True: roasted or raw (shredded). The only ways. Yum! Brussels sprouts are on my shopping list this week, but now I can’t decide if I should roast them or shred them into a salad!